C/2014 Q2 (Lovejoy) is a long-period comet discovered on 17 August 2014 by Terry Lovejoy using a 0.2-meter (8 in) Schmidt–Cassegrain telescope. It was discovered at apparent magnitude 15 in the southern constellation of Puppis. It is the fifth comet discovered by Terry Lovejoy. Its blue-green glow is the result of organic molecules and water released by the comet fluorescing under the harsh UV and optical light of the sun as it passes through space. 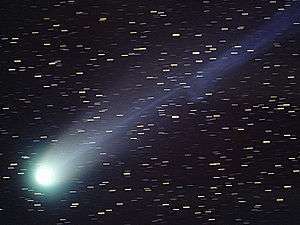 By December 2014, the comet had brightened to roughly magnitude 7.4, making it a small telescope and binoculars target. By mid-December, the comet was visible to the naked eye for experienced observers with dark skies and keen eyesight. On 28−29 December 2014, the comet passed 1/3° from globular cluster Messier 79. In January 2015, it brightened to roughly magnitude 4, and became one of the brightest comets located high in a dark sky since comet C/1995 O1 (Hale-Bopp) in 1997. On 7 January 2015, the comet passed 0.469 AU (70,200,000 km; 43,600,000 mi) from Earth. It crossed the celestial equator on 9 January 2015 becoming better seen from the Northern Hemisphere. The comet came to perihelion (closest approach to the Sun) on 30 January 2015 at a distance of 1.29 AU (193,000,000 km; 120,000,000 mi) from the Sun. At perihelion, its water production rate exceeded 20 metric tons per second. C/2014 Q2 originated from the Oort cloud, but is not a dynamically new comet. Before entering the planetary region (epoch 1950), C/2014 Q2 had an orbital period of about 11000 years with aphelion about 995 AU (1.49×1011 km; 9.25×1010 mi) from the Sun. After leaving the planetary region (epoch 2050), it will have an orbital period of about 8000 years with aphelion of about 800 AU. 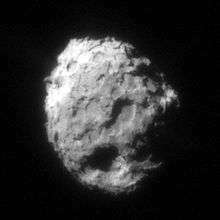 The comet was observed to release 21 different organic molecules in gas, including ethanol and glycolaldehyde, a simple sugar. The presence of organic molecules suggests that they are preserved materials synthesized in the outskirts of the solar nebula or at earlier stages of the Solar System formation. ↑ "Comet Lovejoy". Sky & Telescope. Retrieved 15 March 2015. 1 2 3 4 5 6 "MPEC 2014-R69 : Observations and Orbits of Comets". IAU Minor Planet Center. 2014-09-07. Retrieved 2014-09-14. 1 2 3 4 5 Biver, Nicolas; Bockelée-Morvan, Dominique; Moreno, Raphaël; Crovisier, Jacques; Colom, Pierre; et al. (23 October 2015). "Ethyl alcohol and sugar in comet C/2014 Q2 (Lovejoy)". Science Advances. 1 (9). e1500863. arXiv:1511.04999 . Bibcode:2015SciA....115863B. doi:10.1126/sciadv.1500863. ↑ Plait, Phil (3 January 2015). "Comet Lovejoy, Because Holy Wow". Slate.com. Bad Astronomy. Retrieved 24 October 2015. ↑ Yoshida, Seiichi (2014-12-07). "Weekly Information about Bright Comets (2014 Dec. 6: South)". aerith.net. Retrieved 2014-12-09. ↑ Alan MacRobert (2014-12-15). "Binocular Comet Lovejoy Heading Our Way". Sky & Telescope. Retrieved 2014-12-18. ↑ Bob King (2014-12-08). "C/2014 Q2 Lovejoy – A Binocular Comet in Time for Christmas". Universe Today. Retrieved 2014-12-09. ↑ "JPL Close-Approach Data: C/2014 Q2 (Lovejoy)" (last observation: 2014-10-02; arc: 93 days). Retrieved 2014-10-26. ↑ "C/2014 Q2 (Lovejoy) Orbit at the Minor Planet Center". Retrieved 2015-10-24. ↑ Steigerwald, Bill (23 October 2015). 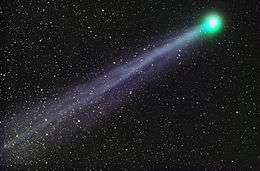 "Researchers Catch Comet Lovejoy Giving Away Alcohol". NASA. Retrieved 24 October 2015. Wikimedia Commons has media related to C/2014 Q2 (Lovejoy).